Reportagem sugerida pelo aluno Felix do 2.o A de Osasco. Interessante a expressão usada pelo jornalista “a década passada foi a década perdida”, a exemplo do que aconteceu com o Japão na década de 80. Enjoy. 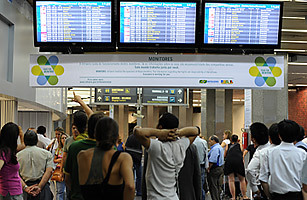 Passengers check the information at monitors in the departure terminal of the Tom Jobim International airport in Rio de Janeiro on April 19, 2010. Everyone should love Brazilian tourists. They spend more per capita than any other nationality. Worldwide, Brazilian tourists shell out an average of $43.3 million a day, dropping a gigantesco $1.4 billion last April alone, up 83% from the same period last year, according to the Brazil’s Central Bank. In 2010, 1.2 million Brazilians visited the United States, injecting $5.9 billion into the U.S. economy. Even exclusive ski resorts in Vermont are scrambling to hire Portuguese-speaking ski instructors to meet the unexpected and rapidly growing demand from thousands of adventurous Brazilians who want to samba down the slopes. “Brazil is our fastest growing international market — up 20% from last season,” says Chris Belanger of Stowe Mountain Resort. In all of Brazil, a country larger than the continental United States, the U.S. has only four consular offices: in the capital Brasilia, Recife, Rio de Janeiro and São Paulo. That means a family living in Porto Alegre would have to spend hundreds of dollars on domestic airline tickets to fly everyone 700 miles to São Paulo, then drop hundreds more on hotel rooms, food and taxis, just to get a visa application interview, which costs an additional $140 each. 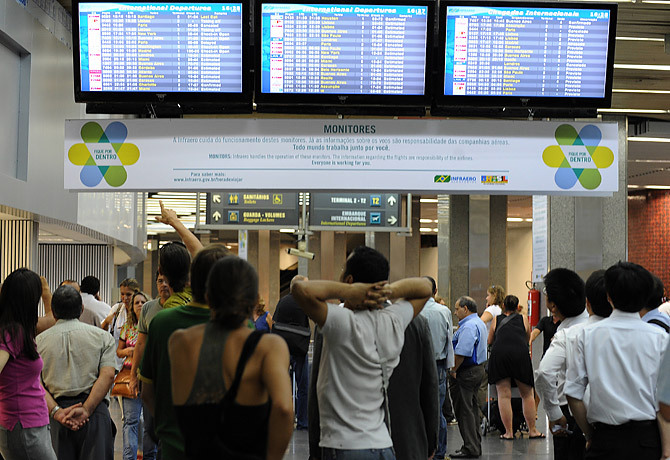 While the State Department claims the average international wait time for a visa interview is 30 days, in Brazil it can be as high as 141 days, according to Steve Joyce of the U.S. Travel Association. That’s not due to bureaucratic laziness. The overworked consular staff in São Paulo is currently processing an average of 2,300 visas every day, more than any other U.S. consulate in the world. And they hope to nearly double their production level by next year to keep from falling farther behind. Brazil represents the fastest-growing non-immigrant visa demand in the world, up 234% over the past five years, eclipsing even China’s 124% increase in U.S. visa issuances, according to the State Department. Indeed, the visa hurdles are at odds with a $200 million PR blitz led by the Corporation for Travel Promotion, a public-private partnership created by congressional law in 2010. While much of the campaign will target traditional markets in Canada and Europe — countries where people don’t need a visa to travel to the U.S. — there will also be a new focus on emerging Latin American markets that already are playing an important role in the recovery of the country’s $134 billion tourism industry. The most lucrative target is Brazil, Latin America’s largest economy. In the past, most Brazilians used to come to the United States looking for work; now they come to spend money and create jobs. The spending would help the U.S. economy tremendously. The American tourism market has recovered slowly since 9-11, but it missed out on a decade of growth, according to Roger Dow, president of the U.S. Travel Association. “We call it the lost decade. If we had just stayed on pace with the rest of the world, we would have generated $606 billion more dollars and have 467,000 more jobs right now,” Dow said recently at the Pow Wow tourism trade show in San Francisco. Indeed, despite U.S. visa policies that treat all Latinos as immigrants vying for American jobs and their piece of the “American Dream,” many are just tourists from down under have already achieved their own Brazilian or Chilean dreams and just want to visit the U.S. and spend their money here. So by not doing more to welcome them, it might just be Uncle Sam who is denying more Americans a better shot at living the dream themselves.